During this year’s festive season, the Hog Roast Southam team were hired by a corporate client to deliver a fantastic Hog Roast. Jade from Mercedes-Benz Cheltenham & Gloucester booked the Hog Roast team to celebrate the Christmas season and the staff’s hard work throughout the year. As the event was for a corporate client, the Hog Roast team ensured that the food was presented in a luxury style to the company’s staff. Jade selected the Festive Menu to be cooked by the Hog Roast Southam team, requested without the mince pies usually service with this menu. The menu included a full roasted Hog which looked stunning once it had been cooked through. In addition, seasonal vegetables were served up with pigs in blankets. Moreover, a huge variety of other festive sides were cooked and served alongside the meat. 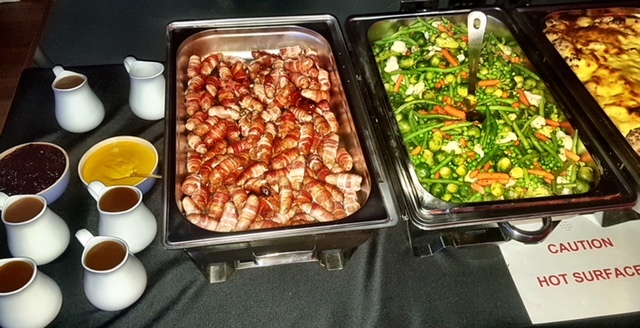 The event was for 130 people and so the Hog Roast Southam team had to ensure that they made plenty of festive food to serve to all of the staff. In addition, the company requested that the food was to be served at 8 pm and so the team had to work hard to ensure that all the food was ready on time as, for such a large event, it was crucial that every guest received their food at the same time. The service was led by the Hog Roast Southam team’s Catering Manager, Greg, who did a fantastic job of maintaining the quality of the food throughout the service. The food was presented along a buffet table to the staff and the roasted hog was placed magnificently on display to the staff. The food looked incredible and there was something for everyone on the Hog Roast buffet. The food was kept warm in metal trays to ensure that all the staff had a great experience of the Hog Roast food. Overall, the event was a fantastic success and all of the Mercedes-Benz staff appeared to really enjoy the food. The event was a fantastic way to get everyone in the Christmas spirit and team enjoyed catering for the wonderful staff.